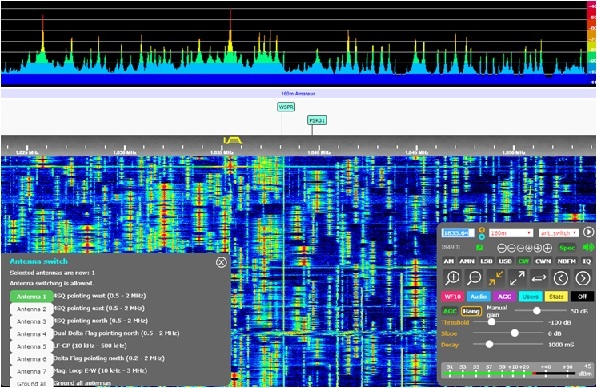 Here is a special feature about my favorite remote listening site, the SM2BYC Remote SDR available on the Internet. It even has low noise directional antennas for medium wave. One of my favorite remote listening sites is operated by SM2BYC in Haparanda, Sweden. Haparanda is a small town in northeast Sweden, near the border with Finland and beside the Gulf of Bothnia. Pretty remote indeed. Mauritz and his brother Lars are both hams and built this amazing remote station using a KiwiSDR. Their efforts at creating low-noise, directional antennas below 3 MHz have resulted in a great monitoring site for use by anyone with a web browser. Many of the OpenWebRX remote sites are plagued with local radio frequency interference. Not so here! I asked Mauriz to tell me more about their station. “This is essentially a rural site but I have a few neighbours within a couple of hundred meters from my location. I have a common setup with my brother Lars, SM2GHI who lives close by. I’m mainly active on 2 meter EME while my brother is mainly a medium wave DXer especially towards NA and Pacific. He is also running a Perseus server from this location with the same antennas as my kiwiSDR is using. We have done a lot of work to reduce the RFI level as much as possible. All the antennas are at some distance from the house. The closest antennas are about 70 meters away and the furthest antennas about 140 meters away. Most of the feed-lines are buried underground with common mode chokes at several locations. Within the house, all Ethernet cables are shielded and the Ethernet switches used have a metal enclosure. The kiwiSDR receiver produces some noise so I had to put it in a RF tight box. I also had to put a U-shaped piece of sheet metal around the Ethernet connector and connect it to the box to get rid of the Ethernet spurs and also overtones from the 48 MHz SPI clock which otherwise affects reception on 2 Meters. This can be seen on the enclosed picture of my kiwiSDR. Fortunately I have so far only had a limited amount of RFI from my neighbors. Users have the ability to switch between a number of antennas, shown in the lower left of the above picture. “I have a number of different antennas for different frequency ranges. Perhaps the most interesting ones are the Dual Delta Flag Antenna (DDFA) and the 4 Square (4SQ) antenna. Both these antennas cover the frequency range 0.5 to 2 MHz, i.e. medium wave and 160 meters ham band. The DDFA is pointing north to cover NA and pacific. These two antennas have similar patterns but the DDFA has a slightly higher attenuation of signals from the rear while the 4SQ has a slightly narrower front lobe. I guess that this 4SQ antenna is the only one which has been built specifically for medium wave DXing. Normally the phasing unit for the 4SQ antenna only allows for reception of one direction at the time. In this phasing unit all four direction are available at the same time so that several receivers can use it simultaneously. The DDFA and 4SQ antennas can be seen in the enclosed pictures. I have attached some pictures from Mauritz. They include the DDFA and 4SQ antennas, as well as the KiwiSDR. We can all learn a lot on reducing RFI from these efforts. Thanks, Mauritz. Hello , I’m a radio dx freak from Gent (between Brugges and Antwerp) , East Flanders in Belgium – Europe. And I did discover the SDR Receiver from Mauritz (SM2BYC) and I’m very mutch amased and very much by all the antenne’s that have in use. But yes the have a lot of open space and that is some thing we on can dreams here in Belgium, cause we are such a very small country. If you drive by car for a about 3 hours you are outside the country. And where very close to The Netherlands oh let say 1 hour drive from Gent. And to France of let say about 1,5 hour. To Germany about 2 hours or so. So that says it all he. I did tune a lot on Mauritz and his brother Lars there SDR Receiver for many times and , yes also did stay up very late to tune in and listen to radio stations from the US. And I also even did hear Japan. That is very great. If Mauritz read this commend I would like to thank him and also his brother for the nice work the did to set this great DX station up. I also like to send him a letter and a postcard over the normal mail. I have this addresses but not this e-mail. But never mind that is fine by me.